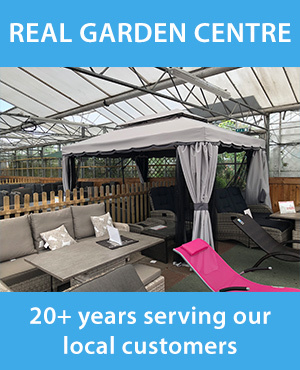 View our online showroom, highlighting a wide selection of great-looking, weatherproof rattan furniture. We carry a varied range of all-season, weatherproof rattan patio chairs, bistro sets, dining and lounging sets, sofas, and corner sets. We deliver any and all of our pieces throughout the UK. 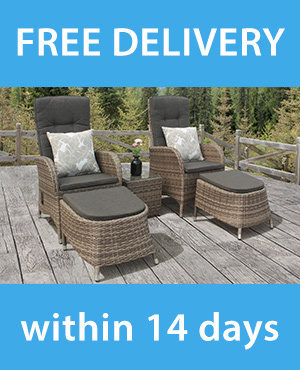 Our durable, all-weather rattan means that stunning sets like these cosy two-seaters won’t fade or deteriorate even in bright UV rays, rain or freezing temperatures. Cushions are included in the sets. Colour choices include grey, silver-grey, and cappuccino brown. Nothing says summer like an outdoor meal on one of our beautiful rattan dining sets. They come in a range of sizes, too, including 4, 6 or 8 comfortable armchairs with suitably-sized table. Taking indoor comfort to your outdoor patio is easy too, with our range of rattan sofa sets. The aluminium frames are covered in all-weather synthetic rattan, so they’ll continue to look great through rain and shine – no need to rush out and drag them into a shed, or worry if you leave them out and the skies are darkening. They are even modular, so they can configure to whatever shape of outdoor space you want to furnish. Looking more for a quiet spot of solitude? A comfortable rattan chair can support you in comfort and style – whether that means lying back in the sun or tucked away in a shady garden corner. Choose from luxurious armchairs or soothing rocking chairs – each of them is constructed of durable, all-weather materials and a beautiful rattan finish. What garden furniture can be left outside all year round? Yes, these beautiful pieces are marked as ‘weatherproof,’ which means they can be left outside all year long. Weatherproof pieces are usually made of weatherproof rattan over an aluminium frame, or from composite furniture (such as the Winawood variety). What is plastic resin wicker made from? This wicker is a new, synthetic variety made from uPVC or plastic resin. It is hand woven around the frame of the furniture, just like natural rattan would be, but it is much more durable. It is UV stabilised and waterproof; it won’t crack, peel, split or splinter the way natural rattan will. Is this resin garden furniture? Yes, synthetic rattan is considered resin garden furniture. Do you deliver to the United Kingdom? We deliver any and all of our pieces throughout the United Kingdom. No. The rattan has been treated to withstand UV bombardment without deteriorating the way non-synthetic rattan would. It will keep looking the way it did when you bought it. No. The frames and other metal components are aluminium, which doesn’t rust. Yes, all of the main cushions are included in the purchase price. Adding your own decorative cushions is a great way to personalise the look. Can this be used on decking? Yes, our sets are designed for outdoor use, on decking, patios – or even on lawn. If you use them on decking, be sure that chairs and benches are not placed too close to edges or stairs. Can this be used on my balcony? Yes, they can turn a plain balcony into a little, comfortable get-away. Can this be used on my patio? Yes. Our pieces were designed for outdoor use, all year long, and are perfect for turning a bare patio into a luxurious outdoor space.